Toby Jones Fishing: It's deer season... and the fish ARE still here! Even though it's the middle of deer season, I decided to make a stop by the river today... I needed to see if the fish were still here. 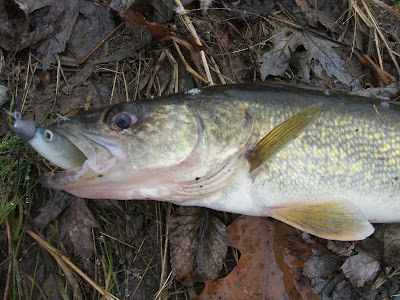 As most of you know, the majority of outdoorsmen in central PA would just as soon forget that there actually are fish in our local waters during deer season. But, I am here to tell you that the masses are mistaken--the fish are still here... And they will actually bite! You just have to go fishing instead of hunting to catch them, ha ha. Actually, my original plans for today were to spend a few hours in the woods hunting this morning before work... But, after a last minute change in schedule, I decided to spend an hour or so hitting the river instead. I'm glad I did. I didn't catch a lot, but I did have a few hits and managed to land a nice 19" walleye and a pretty smallmouth bass around 17". Both fish were caught on swimbaits that were rigged on jigheads. 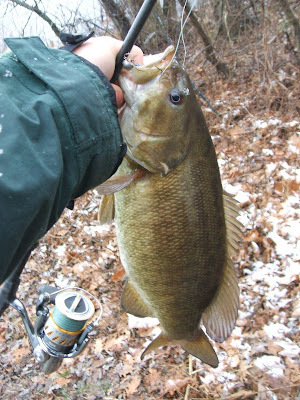 Conditions were good today, and I wish I would have had a little bit more time to fish the area more thoroughly. I think if I would have had a little bit more time I probably would have caught a few more fish this morning. A storm front just moved into the area and began dropping the season's first snowfall. A lot of times, fishing the beginning of a storm or unsettled weather condidtions can be very productive, and today was no different. Still, even though I didn't get to fish as much as I wated to today, I know the fish will be around somewhere the next time I get a chance to hit the river. Hopefully you have had a chance to get out to enjoy the woods or the water recently as well. If you are planning an outing in the not to distant future, please don't forget that fall and winter is not just a time for hunting... there are still plenty of fish to be caught. Be safe and good luck. Thanks for reading.